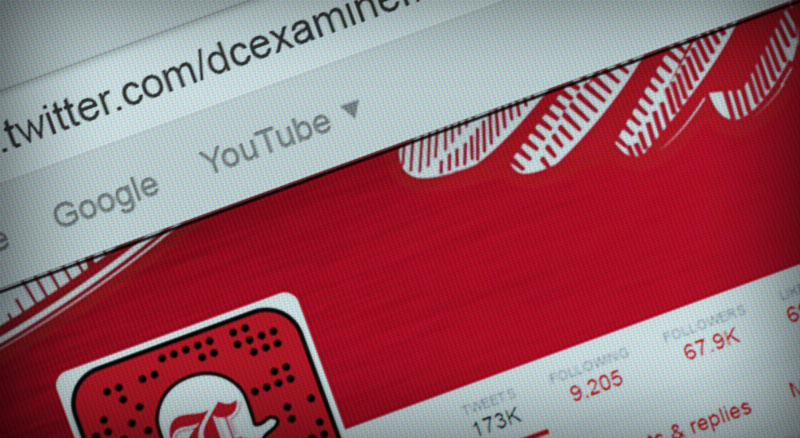 Framing the Story with Video: How the Washington Examiner Increases Social Engagement. Started in 2005 as a print publication, The Washington Examiner is today one of our most active social customers. They're dedicated to engaging readers by bringing them the latest in breaking news and politics. One of the driving forces behind this engagement is Sean Langille (fun fact about Sean, he started writing for his city newspaper when he was in 2nd grade). He was nice enough to chat with us about best practices for social engagement and what life was like before SnapStream. Q: Can you tell me a little bit about your role at the Washington Examiner? Sean: I have the title of Digital Engagement Editor, so I work a lot with social media and different ways to digitally market our product. But I also work with vendors to find ways that we can enhance our product. Part of my job is helping to drive digital strategy in Facebook and Twitter and our multi-media content, working with interns to help curate that content. Q: What is your thought-process behind portraying a visual strategy? Sean: When we tell a story we try to move beyond just using the text. It’s about using infographics, photos and videos. For instance, just now I was using SnapStream to clip the president saying that Donald Trump was “unfit and woefully unprepared”. We understand that people are going to read text, but we have to offer our audience infographics, imagery and video elements. If they can click through and watch a video of Obama saying the quote, then it provides a much stronger presentation. "When we tell a story we try to move beyond just using the text. It’s about using infographics, photos and videos". Q: Can you tell me how you and your team are using SnapStream? How do you find that it is most effective? Sean: The way it usually works is that we have interns help us use SnapStream. Usually myself and the other digital editor will watch videos and speeches and we’ll call out to the interns and say “hey, Obama said this…”. When we’re at the conventions and there are speakers, we’ll all be monitoring it. We actually have a dedicated "Slack" channel that is actually called “SnapStream”, and we can post in there “hey, so-and-so said this, who can grab it?”. The interns cut that up, and then I go through that in the library and further fine-tune it. From there, we put it out to Twitter or Facebook, using "ShowSqueeze" to put it out to Facebook. We use a social distribution platform called “SocialFlow”, so sometimes we’ll do a combination of directly publishing from SnapStream or sometimes we’ll put it directly into SocialFlow to best optimize when that video should go out. We’d love to see an option to recycle from within SnapStream (UPDATE! This functionality is now available in SnapStream 7.2). 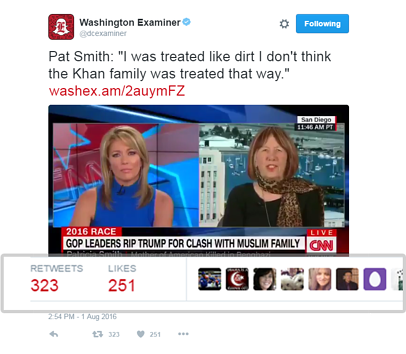 For instance, we had one yesterday… Pat Smith was on CNN and we tweeted it out and got 300+ retweets with just that video. We know that kind of content is popular with our audience so it would be great if we had a way to re-package that. "Now that we have SnapStream, within minutes or seconds of someone saying something newsworthy, we can get that out and be ahead of our competition". Sean: Prior to SnapStream, during a debate or big event night, we would know when these videos happen so we’d be clipping off of some live stream, literally screen grabbing and then getting it to our video team and then have to wait for editing to push that out. Now that we have SnapStream, within minutes or seconds of someone saying something newsworthy, we can get that out and be ahead of our competition. If we’re the first one to it, then it takes off. 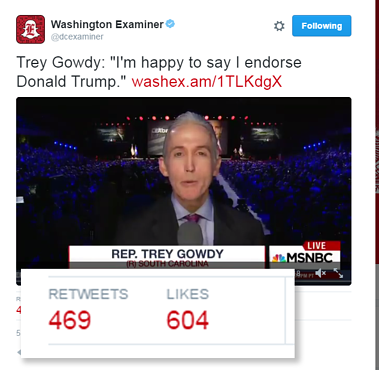 It’s something as simple as Trey Gowdy on "Meet the Press" saying “I endorse Donald Trump”, we take that phrase, put it out there and we’re one of the first. With the amount of social engagement it can drive… I don’t think we could live without it. Q: Can you tell me about the team workflow? Sean: Myself and my digital editor will tell the interns about someone being on tv, or a speech, or event. We’ll have interns monitoring these events, and we’ll notice certain soundbites, telling them to pay attention to when a particular person speaks, or to look out for certain terms. What we usually have them do is pay attention to the newsmakers or the broader bites. But with their own initiative, they’re able to look at more content and ask us what we think of additional items. Sometimes it’s not about what is being said, but physical reactions. People make weird faces, or we’ll catch interesting things like when CSPAN flashed WikiLeaks during Hillary Clinton’s speech. So we’re able to go back into these clips and create GIFs to capture these interesting little moments… like when we captured Hillary Clinton’s weird reaction to fireworks. Q: How do you manage the timing of social posts? Social happens in an instant, how do you make sure that you’re heard? Sean: It’s about staying in time, but sometimes offering a little bit different. Can we capture the side that no one else is looking at, getting the contrarian viewpoint. Showing the different sides of the story and not just the one that is popular. Q: How are you using this for conventions? Sean: We have setup VPNs, so that people can log into SnapStream wherever they are. This is what we did at the conventions. Overall, things were functioning well and we were able to log in and clip things, as well as coordinate with the interns back in DC. Q: So, you being away from the office isn’t constricting your ability to post videos and GIFs on Twitter and Facebook? Sean: No, not at all. "We’re using SnapStream to transform the way we do social". Q: How are you framing the conversation, how are you getting the best reactions? Sean: It’s about keeping track of what everyone else is doing. We use a lot of listening tools to see what the competition is doing. But we’re trying to advance the story. 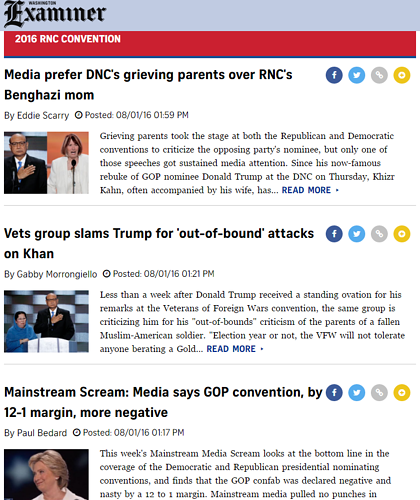 There is the story of Trump fighting with the Kahn family, as compared to the woman who lost her son in Benghazi speaking at the Republican National Convention. We wanted to see what the reaction was to the media coverage of both, and we were one of the few that was using SnapStream to put those videos out there. It’s about being aware of the storyline that everyone else is doing, but what are the other emerging storylines coming out of this. Sometimes it’s about going beyond the other clips that everyone else is putting out. We want to be thought of as a place where you know you can go to get a good snapshot of what was said at the conventions. Essentially, you have a highlight reel of what everyone said. If you look through our Twitter stream and what we did on Facebook during the convention, we put out 100’s of SnapStream videos, using it as a tool for engagement. Q: Why is this something that you are passionate about, where did this need to “show both sides” come from? Sean: I have always been of the mindset that everyone else is covering it the same way, let’s advance the story and see what the other voices are. There are so many voices saying the same thing that in order to differentiate yourself, you have to find ways and find the content that will balance that out. But also, there are stories that will get buried because people are so wrapped up talking about one thing. What I’m most passionate about is telling the story well. You have to have all the elements to do that, whether it’s infographics, video… because news now isn’t just text. When you click on a news story, what’s going to keep you on the page the longest? We want to establish ourselves as an authority for a certain kind of content. So that if you want this kind of content, we are where you go. Q: Thank you so much for speaking with me Sean, is there anything else you wanted to add or talk about before we wrap up? Sean: We’re using SnapStream to transform the way we do social. We’re trying to reach a society that’s a little bit ADD, and entice them to actually read a news story. I think the larger story is how news outlets are using every tool at their disposal, especially SnapStream, to make sure that news as a written medium doesn’t die. 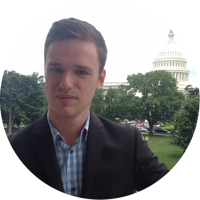 Sean Langille is Digital Engagement Editor for the Washington Examiner. He also serves as an associate producer for Fox News Channel, where he aided in the launch of the Fox News First daily political email newsletter. Sean also has an extensive radio background having produced "The Laura Ingraham Show" and working as an on-air host in Virginia and Massachusetts. This entry was posted on Friday, September 09, 2016 at 01:43 PM. You can follow any responses to this entry through the RSS feed.